Golden amber color. Complex aromas of pineapple upside down cake, chocolate rice cereal with milk, bananas on graham cracker, corn silk, shortbread, and spiced orange with a silky, vibrant, fruity medium-full body and a warming, intriguing, medium-length cinnamon candies, dark chocolate chunks, cola nut, and tobacco finish. A lip-smacking bourbon with excellent acidity that drinks effortlessly. Bottom Line: A lip-smacking bourbon with excellent acidity that drinks effortlessly. 90 • Redemption Rye Whiskey 46% (USA) $28.00. 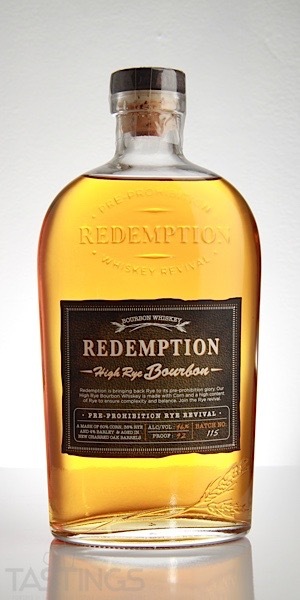 89 • Redemption High Rye Bourbon Whiskey 46% (USA) $28.00. Bourbon Whisky must contain a minimum of 51% corn, be produced in the United States, be distilled at less than 80% ABV (160 proof) and be aged in new charred oak barrels; 'straight' bourbon must be aged for a minimum of two years, although in practice virtually all straight whiskies are aged at least four years. Any bourbon, or any other domestic or imported whiskey, for that matter, that has been aged less than four years must contain an age statement on the label. Small Batch Bourbons are bourbons that bottled from a small group of specially selected barrels that are blended together. It should be noted though that each distiller has their own interpretation of what constitutes a "small batch." Single Barrel Bourbon is bourbon from one specifically chosen cask. The Taste: Flavor descriptors such as toffee, pralines, vanilla, and dried fruit to describe the initial rush of flavors in a good, well-aged bourbon. The charred oak barrels give bourbon a distinctive spicy oak firmness that is unique to American whiskeys. The first waves of British settlers in North America were a thirsty lot. It is recorded that the Pilgrims chose to make final landfall at Plymouth, Massachusetts, even though their original destination was elsewhere, primarily because they were almost out of beer. The first locally-made alcoholic beverage was beer, although the limited supply of barley malt was frequently supplemented by such local substitutes as pumpkin pulp. Distilled spirits soon followed, with rum made from imported Caribbean molasses dominating in the northern colonies, and an assortment of fruit brandies in the south. In the early 1700s a combination of bad economic times and religious unrest against the Established Church in Great Britain set off a great wave of emigration from Scotland and Ireland. These Scots, and the Protestant Scottish settlers from the Northern Irish province of Ulster who came to be known as the "Scotch-Irish" in the new World, brought to North America their religion, their distrust of government control, and their skill at distilling whiskey. This rush of humanity, augmented by German immigrants of a similar religious and cultural persuasion, passed through the seaboard colonies and settled initially in Pennsylvania, Maryland, and western Virginia. Mostly small farmers, they quickly adapted to growing rye because of its hardiness, and, in the western counties, Native American corn because of its high yields. Grain was awkward to ship to East Coast markets because of the poor roads; so many farmers turned to distilling their crops into whiskey. In Pennsylvania these were primarily Rye whiskies; farther to the west and south Corn whiskies predominated. By the end of the American War of Independence in 1784, the first commercial distilleries had been established in what was then the western Virginia county of Kentucky. From the start they produced corn-based whiskies. In 1794 the new, cash-strapped Federal government imposed the first federal excise tax on distillers. The farmer-distillers of western Pennsylvania responded violently in what became known as the Whiskey Rebellion. Federal tax agents were assaulted and killed by angry mobs. Order was finally restored when the federal government sent in an army of 15,000 militiamen, led by George Washington, to put down the revolt. The ringleaders were convicted and sentenced to be hanged, but cooler heads prevailed, and after jail time they were pardoned and released. This situation did provoke a new migration of settlers into the then-western frontier lands of Kentucky and Tennessee. In these new states farmers found ideal corn-growing country and smooth, limestone-filtered water—two of the basic ingredients of bourbon whiskey. The name "bourbon" comes from a county in eastern Kentucky, which in turn was named for the bourbon kings of France who had aided the American rebels in the Revolutionary War. bourbon County was in the early 19th century a center of whiskey production and transshipping (ironically, at the present time, it is a "dry" county). The local whiskey, made primarily from corn, soon gained a reputation for being particularly smooth because the local distillers aged their products in charred oak casks. The adoption of the "sour mash" grain conversion technique served to further distinguish bourbon from other whiskey styles. By the 1840s bourbon was recognized and marketed as a distinctive American style of whiskey, although not as a regionally specific spirit. bourbon came to be produced in Kentucky, Tennessee, Indiana, Illinois, Ohio, Missouri, Pennsylvania, North Carolina, and Georgia, among other states. The only legal location requirement for calling a whiskey "bourbon" is that it be produced in the United States. Initially bourbon was made in pot stills, but as the century progressed the new column still technology was increasingly adopted. 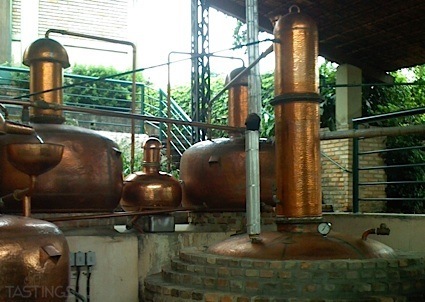 The last old-line pot still plant closed in Pennsylvania in 1992, but the technique was revived in Kentucky in 1995 when the historic Labrot & Graham Distillery was renovated and reopened with a set of new, Scottish-built copper pot stills. The late 19th century saw the rise of the Temperance Movement, a social phenomenon driven by a potent combination of religious and women’s groups. Temperance societies, such as the Women’s Christian Temperance Union and the Anti-Saloon League, operated nationally, but were particularly active in the southern states. The notion of temperance soon gave way to a stated desire for outright prohibition, and throughout the rest of the century an assortment of states and counties adopted prohibition for varying lengths of time and degrees of severity. This muddle of legal restrictions played havoc in the bourbon industry, as it interfered with the production and aging of stocks of whiskey. National Prohibition in 1919 had effects on the bourbon industry beyond shutting down most of the distilleries. Drinking did not stop, of course, and the United States was soon awash in illegal alcohol, much of it of dubious quality. What did change was the American taste in whiskey. Illicit moonshine and imported Canadian whiskeys were lighter in taste and body than bourbon and Rye. The corresponding increase in popularity of white spirits such as Gin and Vodka further altered the marketplace. When Repeal came in 1933, a number of the old distilleries didn’t reopen, and the industry began a slow consolidation that lasted into the early 1990s, at which time there were only 10 distilleries in Kentucky and two in Tennessee. In the 21st century consumers have a renewed passion for their local spirit. Today, bourbon is highly sought after by people from all walks of life. Perceived shortages have raised prices and created scarcity that has piqued the interest of new enthusiasts and collectors. The recent craft spirits movement has created a boom of production with bourbons now being made all over the country in a wider range of styles than ever before. Redemption High Rye Bourbon Whiskey rating was calculated by tastings.com to be 89 points out of 100 on 10/29/2018. Please note that MSRP may have changed since the date of our review.